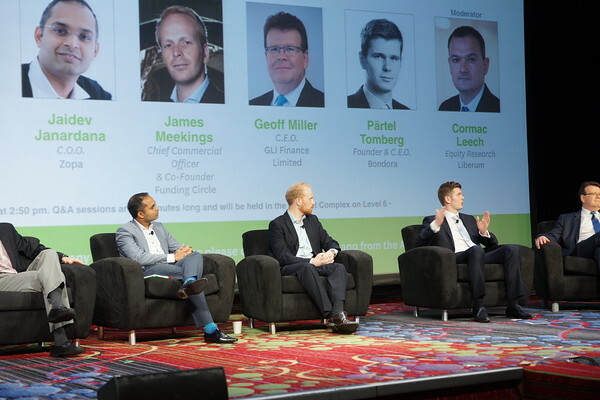 The largest alternative finance conference in the world, LendIt USA 2015, took place from April 13-15 in New York. 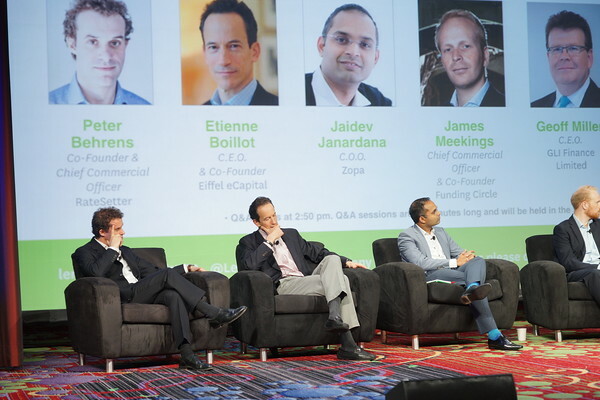 The panel for the European Online Lending Opportunity discussion was comprised of international experts, including Partel Tomberg, CEO and co-founder of Bondora. Continue reading below for an edited excerpt of the recent panel discussion. What are the net returns available on European peer lending platforms? Tomberg: We focus on assets that deliver a 15-20% net return to investors. Europe is an underserved market, and in most countries we operate in Bondora is the only alternative to borrowers outside of their home bank. P2P loans represent just 0.1% of outstanding consumer debt and thus, the return levels are defined by the competition in the banking sector and European Central Bank. Our risk model accounts for economy risk and thus, we still expect to deliver 15-20% returns to our investors even in a stressed environment. Behrens: The yields on our platform are 6-6.5% and the Provision Fund is expected to protect investors from increasing defaults in case of a stressed environment. Janardana: We focus on super prime and prime loans, so the returns are 4-4.5%, with losses below 1%. What would make your platforms grow faster? Miller: We see vast opportunities, but we’re not focusing on fast growth. We want to see controlled growth. Meekings: Business has changed over the last 18 months. The government used to account for 20% of the funding volume. Now 40-45% of funding comes from institutional investors. What drove the growth is stronger investment in marketing and the onboarding of institutional investors. We’re looking to double in the next couple of years. Tomberg: Availability of capital is our main constraint of growth. 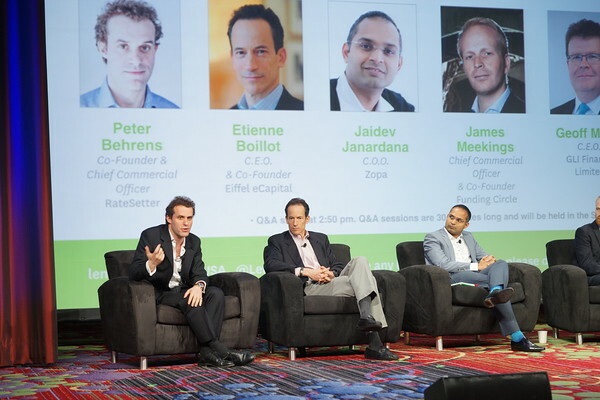 To date, we’ve mostly focused on the borrower funnel and have not worked actively on onboarding institutional capital. We have the capacity to grow to a volume of up to EUR 15 mln per month without extra investments into marketing. What is the unique selling point for investments in Europe? Why would US or international investors invest on European platforms? Boillot: There are very few US players active in Europe, as returns in Europe are considerably lower (with the exception of Bondora’s offering). European institutional investors on the other hand are very interested in investing in the US. However, there are still many institutional players that have a very limited understanding of what peer lending is. Miller: US investors can live without European platforms. For the same risk, you can get a higher return in the US than in Europe. In addition, there are currency risks. The only reason for US investors to look at Europe is diversification. Meekings: Funding Circle wants institutional investors to invest across the border in order to diversify and protect investment in case of crisis. Janardana: Some of our investors deliberately choose Europe because they can use leverage and increase net returns (lower default rates allow for the use of leverage). Do we expect a catch up of Europe to the US level of P2P lending penetration? Boillot: I don’t think its inevitable, but larger European economies are catching up. But earlier they didn’t have the legal framework and government support. I don’t think it’s lobbying by the banks; they are just slow. Default rates in the US are higher because culturally defaulting in Europe is a huge problem, but accepted in US. So lenders are more cautions about cultural intolerance by default. How open are you to institutional investors? Meekings: We are aware that we need to be more diversified, and thus are working with institutional investors, but still to date ~97% of investors are retail investors. We are starting conversations with a bit more vigor. Janardana: 30-35% of the new loan book is funded by institutional investors, and we’re speaking with a few more. Some institutional investors are using leverage to boost their returns. One difference of our platform: we do not allow picking loans – all investors get a blend of loans. Tax incentives(ISA): what will those do to the overall volume? Are there enough borrowers if the investment volumes increase significantly? Meekings: There is a huge opportunity for lenders, but the bottleneck will be in peer lender capacity to generate borrower demand. Miller: [Will rates go down with tax incentivized capital influx?] Not really. If all this money goes into one platform then yes, it will drive rates down on this platform, but not overall for the market. Leech: Banks in the UK will need to refer rejected customers to peer lenders and get paid for that. Miller: Banks will look into partnering with peer lenders, as this will help them increase profitability of the loan portfolios. Meekings: We partnered with Santander and actively work with banks in advance of the regulation [that will require banks to refer rejected lenders to alternative finance providers]. The UK government catalyzes the [alternative finance] sector. Why is the US government less excited about the sector? Boillot: I don’t want to comment on the US government, but can comment on Europe. The French government is actively learning what the UK government is doing to catalyze the sector. This kind of level of involvement will help (create the environment and regulatory framework). But this will take some time. Miller: From the the US perspective, the US government won’t do anything because no one wants the government to get involved in anything. You don’t need to worry about government intervention. But in the UK, the government was helpful in the development of the model, and now other European governments want to replicate this success by putting money and resources into peer lenders and alternative lenders. How difficult is it to operate across different European markets? How tough are the regulatory regimes across countries? Tomberg: The UK market isn’t much different from other European markets from the regulatory standpoint. It’s just that there is more public sector support for the industry. The difference is in the type of licenses you need to operate as a peer lender and how long it takes to obtain those licenses. In most other European markets, it is possible to operate using a banking license. So there is a similar setup but a difference in government support. We were part of many surveys by the European Central Bank and European Commission, but nothing happened after those surveys. There were just bigger problems to solve, so peer lending – despite the potential – isn’t big enough for European governments to single out. So we proceed by just following the existing regulatory framework and acquiring all needed licenses to operate across Europe. Partel, Bondora is an outlier, as you operate across multiple markets. Why do you feel this is a correct strategic decision? Tomberg: We have investors from 34 countries, and facilitate loans to borrowers across 4 markets with a plan to operate in all Eurozone countries. We look at Europe as a single market and go for the full potential because we don’t want to play a catch up game with US peer lenders. The largest European countries are comparable to the size of California, while most of the countries in Europe are marginal when compared to the US. But in total, the Eurozone market is comparable in the size of pupulation and GDP to the United States. While there is still much work to be done, there is huge potential for peer lending in Europe. The UK currently represents the largest peer lending market in Europe, but is still minimal in comparison to the US and to traditional lenders. For a full stream of the European Online Lending Opportunity panel discussion, click here [recording of the panel starts at 00:31].